No, this isn't a vacation photo! We took my mom on a beach adventure right here in town. I always dismissed our local lake beaches as a little trashy--the parks and the people. Was I wrong or what! Today was like going to Florida without the drive. At first, we got lost finding Percy Priest Lake's Anderson Rd. recreation area (off Bell Rd.). We paid $4 for the whole carload of people and set off down the wooded slope. Wow! At 9:30 am, we had the sandy beach to ourselves. The maintenance workers cautioned us that weekends are impossibly crowded, though. By noon, a small number of moms and children played happily alongside us--building sand castles and floating on kickboards. Shady picnic tables and a playground lie nearby. This makes a perfect playdate during the week! You can also purchase a $30 pass that gives your vehicle access to every Corp of Engineer lake recreation area--in the entire US! Wow, thanks for the tip! I would have never guessed it would be that nice there, I'll definitely have to check it out! Oh my gosh I can't get over how nice that looks! I live about 5 minutes from there, now I can't wait to go! Wow! Thanks for sharing, Meredith. We'll definitely have to check that out once swimming lessons are over. I grew up on the lakes in Maine so I, too, have dismissed the lakes here. Seeing this beach is only 4 minutes from my front door, I just might have to check it out. Thanks for paving the way! So fun!!! 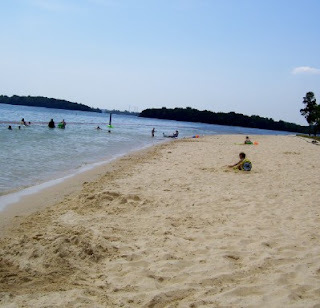 I hear there is a great beach area near our new house, so I look forward to trying that, as well as the Percy Priest beach area. Thanks for the idea! !